The first event, on 19 March, was organised by the University of Tokyo as part of a wider collaboration with the University of Cambridge, entitled ‘2nd Cambridge-Tokyo “Future Technology for Sustainability (FTS)”’. This event was one of the joint workshops for the 4th Cambridge-UTokyo Joint Symposium, held on 27 March. The FTS workshop enabled researchers from both universities to discuss collaboration opportunities such as student exchange programme development and joint manufacturing research moving forward between the IfM and the School of Engineering of the University of Tokyo. Key attendees from the University of Tokyo included: Professor Yasushi Umeda, Professor Tomonari Yashiro and Dr Yusuke Kishita. Professor Tim Minshall and Dr Robert Phaal represented the IfM at this joint workshop. The second event, on 20 March, was organised by the Advanced Institute of Industrial Technology, entitled ‘Strategic Roadmapping Research and Practice in the Asia-Pacific Region’. This event was held in cooperation with the Cambridge-Tokyo “Future Technology for Sustainability (FTS)”. In this regional seminar, with the theme of strategic roadmapping, leading industrial practitioners and researchers in the Asia-Pacific region gathered in Tokyo, to network with each other and to discuss future regional collaboration opportunities for roadmapping research and practice. Key industrial and academic attendees from the Asia-Pacific region included: Mr Ivan Tandyo of Navanti Holdings Pty Ltd from Australia and Indonesia, Professor Nathasit Gerdsri of Mahidol University from Thailand, Professor and President Seiichi Kawata and Professor Satoshi Yoshida of the Advanced Institute of Industrial Technology from Japan, Professor Sungjoo Lee of Ajou University from South Korea, Mr Toshiyuki Suzuki of IHI Corporation from Japan, Professor Yuan Zhou of Tsinghua University from China, Dr Yusuke Kishita of the Japan Society of Mechanical Engineers (JSME) and the University of Tokyo from Japan. Dr Robert Phaal, Dr Hyunkyu Park and Dr Yuta Hirose represented the IfM at this seminar. The third event, on 22 March, was organised by the Japan Society of Mechanical Engineers (JSME), entitled ‘Technology Roadmapping for Sustainability’. In this seminar, key experts from Japanese government agencies gathered together with industry and academia to exchange experience and ideas on roadmapping from both theoretical and practical perspectives, aiming to build mutual learning of relevant practice and experiences in Japan and the UK. Key attendees for this seminar included: Dr Koichi Ohtomi of the Japan Society of Mechanical Engineers (JSME), Dr Masayoshi Watanabe and Dr Yuto Nakagami of the New Energy and Industrial Technology Development Organization (NEDO), Dr Michiharu Nakamura of the Japan Science and Technology Agency (JST), Dr Shigeyuki Sekine of the National Institute of Advanced Industrial Science and Technology (AIST), and Dr Yusuke Kishita of the University of Tokyo. Dr Robert Phaal and Dr Yuta Hirose represented the IfM at this seminar. 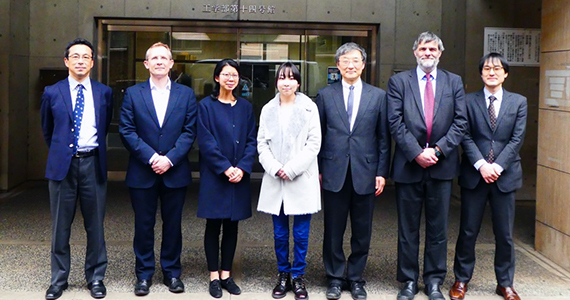 Lastly, the 4th Cambridge-UTokyo symposium was held at the University of Tokyo on 27 March. In the session of ‘Showcases of Existing & Future Possible Collaborations’, Professor Tomonari Yashiro of the University of Tokyo explained the collaboration history with the IfM since 2010 and introduced future collaboration activities such as a three-month stay in Cambridge planned by Dr Yusuke Kishita of the University of Tokyo by utilising his sabbatical leave. Professor Tomonari Yashiro explaining the collaboration history with the IfM. For more information about the workshop and roadmapping seminars, and other IfM CTM and IfM ECS related events in Japan, please contact Dr Yuta Hirose.